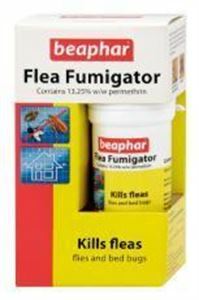 The Beaphar Flea Fumigator is a smoke generator that will get rid of fleas, flies and bed bugs in a domestic situation. Apply at a rate of 120m cubed for flying insects, 30m cubed for fleas and carpet moths or 7.5m cubed for bedbugs, ants and cockroaches. For best results fumigate in the late afternoon and leave the house or building for a minimum of 2 hours. Always follow the guidelines.